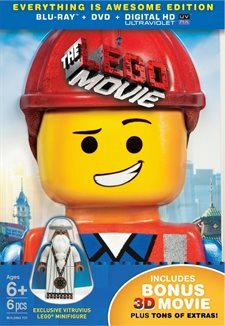 Emmet (Chris Pratt), an ordinary LEGO figurine who always follows the rules, is mistakenly identified as an extraordinary being and the key to saving the world. He finds himself drafted into a fellowship of strangers who are on a mission to stop an evil tyrant's (Will Ferrell) plans to conquer the world. Unfortunately for Emmet, he is hopelessly -- and hilariously -- unprepared for such a task, but he'll give it his all nonetheless. 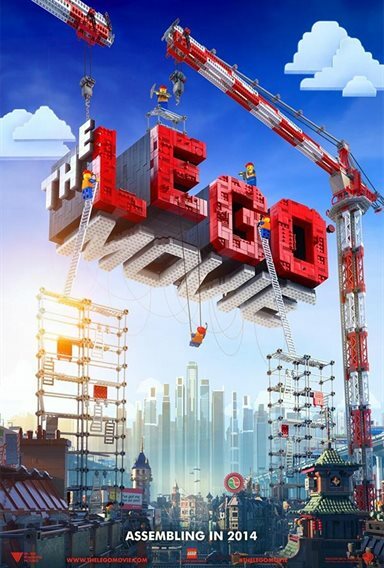 Download The Lego Movie in Digital HD from the iTunes store. The Lego Movie images are © Warner Bros.. All Rights Reserved. My fellow Master Builders, this week Warner Brother will release "The Lego Movie" in a special "Everything is Awesome Edition" Somebody cue the music! If you haven't seen "The Lego Movie" yet, let me fill you in! As the wise prophet Vitruvius (Morgan Freeman) proclaims "One day, a talented lass or fellow, a special one with face of yellow, will make the Piece of Resistance found from it's hiding refuge underground, and with a noble army at the helm, this Master Builder will thwart the Kragle and save the realm, and be the greatest, most interesting, most important person of all times. All this is true because it rhymes." Push forward and meet Emmet Brickowoski, just your average run of the mill Lego construction worker. Emmet, completely lacking in self-confidence, is trying so hard just to fit in. Emmet lives in a city that's run by President Business (Will Ferrell) who pushes the need for conformity, non-creativity and even brainwashes his citizens to follow his instructions (or you'll be put to sleep). Emmet is simple, not so creative and really tries so hard to fit that he follows a How to manual on "How to Fit In". Step 1: Breath. Step 3: Exercise. Step 11: Greet your Neighbors. Step 13: Enjoy Popular Music….cue the music! You know what's awesome, everything! One day, while on his constuction site, Emmet falls and completely by accident finds the "Piece of Resistance." Emmet wakes to find he is being interrogated by Bad Cop (Liam Neeson) who works for Lord Business (otherwise known as President Business) Bad Cop wants to know all about Emmet's plan to foil Lord Business's plan but Emmet is all but clueless as to what is going on. Wildstyle breaks out Emmet, believing he is "The Special" and takes him to the Old West to find Vitruvius. Upon arriving Vitruvius & Wildstyle realize that Emmet is not a "Masterbuilder (one who could create anything from scratch using his own creativity) and decides to make the best of it. While Bad cop is in pursuit at all times Vitruvius, Wildstyle & Emmet make their way thru other Lego lands to Cloud Cuckoo Land to meet up with the Council of Masterbuilders to come up with a plan to ward off the evil Lord Business. Emmet comes clean to the council and explains that he is just an ordinary guy, not a masterbuilder, creative or even very smart and admits to being unskilled, scared and cowardly at which point the council dismisses Emmet believing he isn't worth their time. Emmet with his small bunch of Masterbuilders still set out to try to take down Lord business and once Vitruvius tells Emmet "You must embrace what is special in you" Emmet gains that spark of confidence that allows him to step up. All of a sudden Emmet is the one who can come up with the plan. Emmet may not be a Masterbuilder, but he is the glue that connects all the Masterbuilders into a team that can defeat Lord Business. Just proving, while you may think your ordinary, Everyone in their own right, is Awesome! Whats truly Awesome, is while there is tons of humor for the adults as well as lots of throw-back Lego characters that we all played with as kids, this movie is filled with good morals for kids to learn. Originality if better than conforming, Don't be so quick to judge people before you get to know more about them, Being a good guy can win the girl and so on. Each time you watch it you will find more cool hidden gems and deeper meaning. While there have been many Lego video games, movies and DVDs, none come up with the depth of character that Emmet brings to "The Lego Movie." Emmet played by Chris Pratt (Parks & Recreation) gives Emmet the soul of a happy looser that doesn't mind making fun of himself, but really just wants to be loved, which I'm sure everyone could relate to at some point in their lives. The Cast in "The Lego Movie" is HUGE! Everyone from Will Arnett playing Batman, Nick Offerman playing Metal Beard and cameos by Shaq (playing himself), Jonah Hill (Green Lantern), Channing Tatum (Superman), Billy Dee Williams (Lando) and even Anthony Daniels gets to voice C-3PO. Now this "Awesome Edition" has the 2D DVD, Blu-ray versions, the 3D Blu-ray as well as a Digital HD Ultraviolet code that you can use to watch anywhere! It comes with a 3D movie art with Emmets face and even comes with and Exclusive Vitruvius Lego Minifigure! Along with the movies, there is a TON of special bonus features . Everything from a sing a long of…..
….to a full behind the scenes on how they created the movie brick by brick. They even have a few spots that will teach you how to make a couple of the items in the film including the double decker sofa. Shorts that will show you the true Masterbuilders and how they came up with all the vehicles used in the film along with a contest they had to come up with crazy flying vehicles out of ordinary items that would be used in the final fight sequence in the film. Also included are some short film pieces that were created by Lego fans for a contest Lego held. I give "The Lego Movie: Everything Is Awesome Edition"
If you're looking for an awesome movie to watch with the family on Taco Tuesdays, search no further! Just grab your overpriced cup of coffee and sing along….oh why not! ONE MORE TIME! It was really funny, I know it's a more of a kids movie but it was still entertaining. Hoping for a good movie! !